This DVD version also includes subtitles in English. 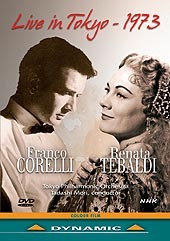 This DVD version also includes an interview with Tebaldi as well as subtitles in English and in French. Final scene from Act 2 of Tosca, Regata Veneziana, O mio babbino caro. Also features a huge number of photographs. Subtitles in English, Italian, and German. - Willow song and Ave Maria from Otello. Vicino a te from Andrea Chenier, with Franco Corelli (from Ed Sullivan Show). Final scene from Act 2 of Tosca (with Louis Quilico), O mio babbino caro from Gianni Schicchi, Regata veneziana, Vissi d'arte from Tosca, all from 1965 Canadian telecast. Sì, mi chiamano Mimi from La Boheme (1956). O patria mia from Aida (Paris, 1959). 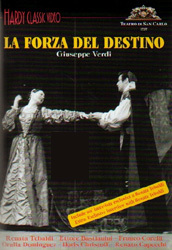 Arias from Otello, Madama Butterfly, Adriana Lecouvreur, Manon Lescaut, Gianni Schicchi, Aida, and Regata Veneziana. Final scene from Act 2 of Tosca, Regata Veneziana, O mio babbino caro from Gianni Schicchi. CBC Festival Orchestra conducted by Ernesto Barbini. A 1965 Canadian telecast.